Biržai Castle "On Air News"
20 July, 2013. 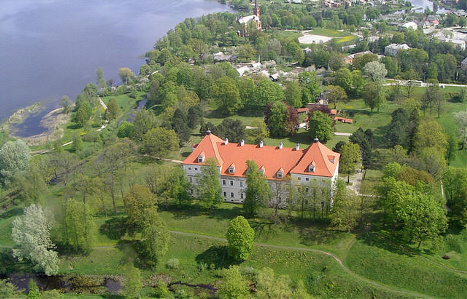 06:00-07:00GMT (80-40-20m bands) LY2SQ/P and LY3KB/P was On Air from Biržai Castle. WCA activity was stoped by rain at 07:00GMT. About WCA activity Weekend 2013. Picture story from WCA Weekend 213. 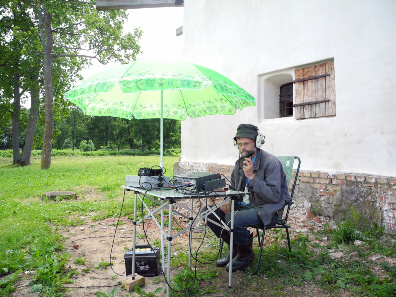 First LY3KB participation in the World Castles Award program was the work on Air from Biržai Castle (WCA #LY-00002) in World Castles Weekend 2013. 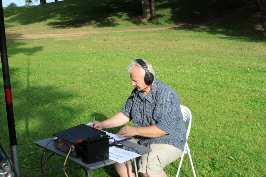 Biržai Radio Club Team: LY2SQ/P Šarūnas, LY3B/P (Algis) and LY3KB/P (Valius) take part in this event on June 15, 2013. Now in Biržai Castle: Biržai Region Museum "Sėla", Biržai district public Library and Biržai Castle Restaurant "Pilies skliautai"
Historical facts: To protect his Biržai dominion and the northern border of Lithuania, Duke Kristupas Radvila (engl. Radziwill) (1547-1603) built a modern fortress. Work started on it in 1575 by building a dam at the confluence of the Apašcia and Agluona rivers. The fortress and the town were a single defence complex and was finished in 1589. The war with Sweden lasted many decades (1600-1635 and 1655-1660) and in 1625 the Swedes turned Biržai Castle into ruins. Kristupas Radvila II initiated a considerable reconstruction of the fortress in Biržai, with work starting in 1637. This wasn’t just a restoration; the fortifications were changed from Italian to Dutch, which meant that the earth bastions and ramparts surrounding the fortress became its main features. Reconstruction also involved the territory of the castle and residential palace. In 1640, Biržai was inherited by the future grand hetman of Lithuania, son of Kristupas II, Jonušas Radvila (1612-1655), who continued the reconstruction of the castle. In autumn 1655, the Biržai fortress changed hands again and became Swedish. In 1659, Jonušas Radvila’s cousin, Duke Boguslavas Radvila (1620-1669) made brought the castle back into the hands of the Radvila family. The fortress went to Boguslavas’ daughter Liudvika Karolina (1667-1695). She renewed the reconstruction process in 1671 and work continued until 1682. This fortress was considerably larger than the first one. The palace, fortifications and 21 buildings made it a huge defensive complex. (info from Biržai Museum "Sėla"). QSL Cards with Biržai castle.